Professor Mikiko C. Siomi obtained a Master of Agriculture (1988) and a Ph.D. in Agricultural Chemistry (1994) from the Graduate School of Agriculture, Kyoto University and a Ph.D. in Medical Science (2003) from the Graduate School of Medical Sciences, the University of Tokushima. She worked as a postdoctoral fellow at the Howard Hughes Medical Institute, University of Pennsylvania, with a JST young researcher fellowship for long-term overseas research, and then as a postdoctoral fellow at the Department of Biochemistry and Biophysics, School of Medicine, University of Pennsylvania. In 1999, she joined the Institute for Genome Research at University of Tokushima, where she became an associate professor in 2002 through career progression from an instructor to a lecturer, and then to an assistant professor. She became a JST-CREST research representative in 2007, and an associate professor at Keio University, School of Medicine in 2008. She was appointed to her current position in 2012. The human genome contains somewhere between 20 thousand and 30 thousand genes. A human body is composed of approximately 60 trillion cells, most of which carry almost identical genetic information. Cells have distinct identities even though they share common genetic information because individual cells have mechanisms that regulate the expression of specific sets of genes in appropriate sites with specific timing. “We are interested in small RNAs (approximately 20-30 nucleotides in length), which are involved in the mechanism regulating cell type-specific gene expression” says Professor Siomi. 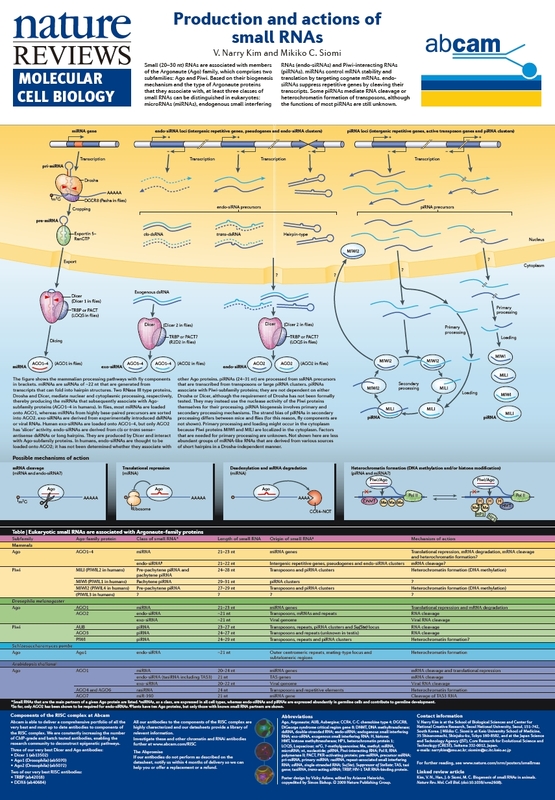 The mechanism by which small RNA regulates gene expression is called RNA silencing. The research focus in the Siomi laboratory is Piwi-interacting RNAs (piRNAs) that are selectively expressed in germ cells. Genomes contain mobile genetic elements called transposons. Among several hypotheses for their origins, the most plausible candidates are catalytic RNA ribozymes that regulate biological reactions, and retroviruses that are composed of RNA and possess transcriptase activity. As part of their survival strategy, both candidates are incorporated in the host DNA as transposons. If these transposons repeatedly self-replicate in the host genome, it damages the genetic information in the host cells. If this event occasionally occurs at a low frequency in only somatic cells, which form the majority of our 60 trillion cells, the outcomes may not be too severe. However, if transposons are transposed in germ cells, which undergo developmental and differentiation processes, they can terminate the transmission of crucial pieces of genetic information. They may also interfere with gametogenesis, resulting in a high frequency of infertility. piRNA prevents such adverse events by inhibiting the expression and transposition on the host genes. The laboratory is trying to make a breakthrough in understanding the mechanism by which piRNAs inhibit transposons in a Drosophila model system. RNA silencing was discovered in 1998 by using Caenorhabditis elegans as a model organism; the 2006 Nobel Prize for Physiology or Medicine was awarded for the discovery. The field is still young and many aspects remain unsolved. “It is challenging and rewarding to explore unknown areas and make significant discoveries ourselves,” says Professor Siomi. Her belief is shared with the other laboratory members. “We will be able to see things that nobody has ever seen before,” says Maomi Seki (M1) excitedly. “It is fascinating to investigate what you cannot find in textbooks,” says Kawamura Hiroki (M1). Laboratory members are on familiar terms with Professor Siomi and simply call her “Mikiko-san.” Professor Siomi and her husband work in the same research field, and they used to work in the same laboratory for a long time. With this as background, members of her laboratory use her first name. She was appointed to her current position in the University of Tokyo two years ago, and her students are still young. 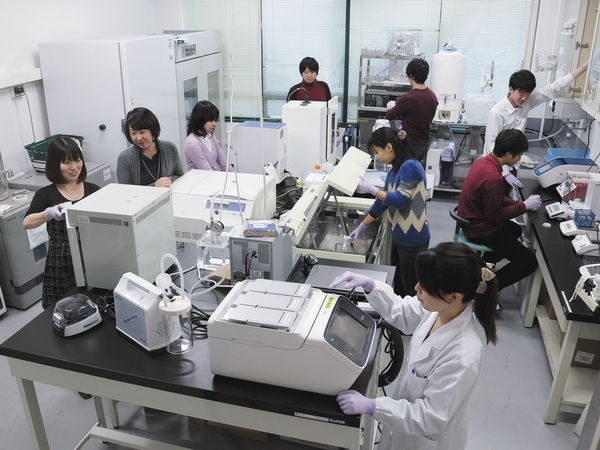 “There is a warm, encouraging atmosphere for exchanging opinions in the laboratory,” says Ryo Oonishi (B4). “Members are friendly and enjoy each other’s company,” says Yumiko Tomoe (B4). When Professor Siomi’s husband moved to the United States for research, she traveled there as well and became a researcher at the University of Pennsylvania. During that period, she met many women who were both researchers and mothers. “Knowing those female scientists, I had no worries or concerns about what I was and am doing, and hope that women in Japan will believe in themselves and tackle the things they want to do,” said Professor Siomi. It is possible that her passion has rubbed off, because 10 of her 19 lab members are women. The connections Professor Siomi established during her time in the United States are an invaluable asset to her. She continues to be invited to international conferences once every few months, and the laboratory hosted overseas students from the United States for six months last year. The laboratory is at the frontier of exploring the mysteries of life, and it is also a place where you can feel connected to the world. 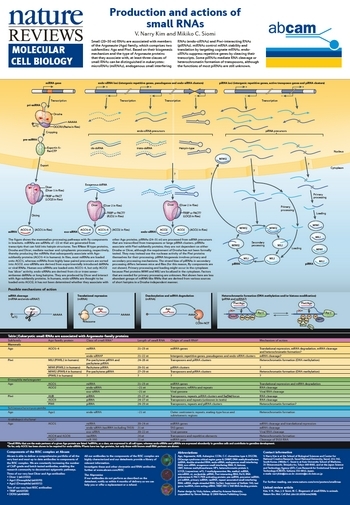 A poster showing the mechanism of biosynthesis of small RNAs that function in vivo and that of small RNA-regulated gene regulation. Published in Nature Reviews Molecular Biology (co-author, Professor V. Narry Kim, Seoul University). Graphics are by Abcam PLC.